John joined the Pennsylvania militia. While guarding an ammunition cache in mid-January 1776, Ross was mortally wounded when the gunpowder exploded. He died on January 21, and was buried in Christ Church Cemetery, leaving Betsy a childless widow at the age of 24. Betsy continued to run her upholstery business, making extra income by mending uniforms and making tents, blankets, musketballs, and cartridges for the Continental Army. Betsy returned to the Quaker fold, in a way – Quakers are pacifists and forbidden to bear arms. This led to a schism in their ranks. When the Fighting Quakers — who supported the war effort — banded together, Betsy joined them. According to Betsy, Washington showed her a rough design of the flag that included a six-pointed star. Betsy, an expert with a pair of scissors, demonstrated how to cut a five-pointed star in a single snip. Impressed, the committee entrusted Betsy with making our country’s first flag. She finished the flag either in late May or early June 1776. On June 14, 1777, the Continental Congress, seeking to promote national pride and unity, adopted the national flag: “Resolved: that the flag of the United States be thirteen stripes, alternate red and white; that the union be thirteen stars, white in a blue field, representing a new constellation.” The Congress left no record as to why it chose the colors red, white and blue. 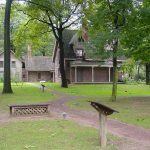 During the winter of 1777, Betsy’s home was used to lodge British soldiers, whose army had occupied Philadelphia. 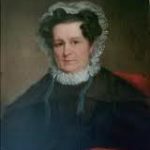 Through it all, she managed to run her upholstery shop, and after the soldiers left, she wove cloth pouches which were used to hold gunpowder for the Continental Army. Betsy was married again on June 15, 1777, this time to sea captain, Joseph Ashburn, in a ceremony performed at Old Swedes Church in Philadelphia, and they had two daughters, Zilla and Elizabeth. Joseph was often at sea, leaving Betsy, a new mother, alone in Philadelphia. On a trip to the West Indies to procure war supplies for the Revolutionary cause, Captain Ashburn was captured by the British. Ashburn and the crew were charged with treason and taken to Old Mill Prison in England. While he was there, nine-month-old Zilla died. Joseph died of an unknown illness before the British released the American prisoners in 1782. Betsy learned of her husband’s death from an old friend, John Claypoole, who had also been imprisoned at the Old Mill. On May 8, 1783, Betsy was married for the third time to John Claypoole. Betsy convinced her new husband to abandon the life of the sea and find employment on the mainland. Claypoole initially worked in her upholstery business and then at the U.S. Customs House in Philadelphia. 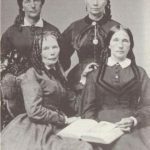 The couple had five daughters (Clarissa, Susannah, Rachel, Jane and Harriet). Betsy was finally able to enjoy a long and happy married life, though there were challenges along the way. In 1784, Betsy returned to her Quaker roots when she and John joined the Society of Free Quakers – a sect that, unlike the pacifist traditional Quakers, supported America’s fight for freedom from British rule. After the birth of their second daughter, the family moved to larger quarters on Second Street in what was then Philadelphia’s Mercantile District. John Claypoole died in 1817, after twenty years of ill health as a result of his earlier war injuries, and Betsy never remarried. She continued working until 1827, bringing many of her immediate family into the business with her. After more than fifty years in her trade, Betsy Ross retired at age 76, and left the city to live on her daughter Susannah Satterthwaite’s farm in the remote northern suburb of Abington. According to her descendents, although her vision was failing rapidly, Betsy continued to take the long carriage ride to the Free Quaker Meetinghouse in the city every week. By 1833, Betsy was completely blind. She spent the last three years of her life living with her daughter Jane’s family on Cherry Street in Philadelphia. Betsy Ross died peacefully in her sleep on January 30, 1836, at the age of 84. She was buried in three locations: first at the Free Quaker Burial Ground. Twenty years later, her remains were exhumed and reburied in the Mt. Moriah Cemetery in the Cobbs Creek Park section of Philadelphia. In preparation for the United States Bicentennial, the city moved her remains to the courtyard of the Betsy Ross House in 1975. Although it is one of the most visited tourist sites in Philadelphia, the claim that Ross once lived in the Betsy Ross House is a matter of dispute. She supposedly lived here from 1773 to 1785. By 1876, the building was generally recognized as the place where Betsy Ross made the first American Flag. In 1898, a group of concerned citizens established the American Flag House and the Betsy Ross Memorial Association to raise money to purchase the house, restore it, and open it as a public museum. In March 1870, in anticipation of America’s Centennial, William Canby, Betsy Ross’s grandson, made public the story of Washington’s visit to the flagmaker. In a paper given to the Pennsylvania Historical Society, Canby related to the world his grandmother’s deeds. Since Canby was only 11 years old when Betsy died, he relied on his own recollections as well as those of other relatives. Three affidavits were sworn to, communicating in clear detail what Betsy Ross often told them the heroic saga of the first American flag. [The committee] showed her [Betsy] a drawing roughly executed, of the flag as it was proposed to be made by the committee, and that she saw in it some defects in its proportions and the arrangement and shape of the stars. That she said it was square and a flag should be one third longer than its width, that the stars were scattered promiscuously over the field, and she said they should be either in lines or in some adopted form as a circle, or a star, and that the stars were six-pointed in the drawing, and she said they should be five pointed. After Canby’s lecture, the story of Betsy and the flag took root in the hearts of Americans. Harper’s Monthly retold the story in a July 1873 issue. In the 1880s, the story began to appear in textbooks.In 1909, Canby’s brother and nephew published a book, The Evolution of the American Flag. That volume cemented widow Ross’s place in the public mind. Of course, this wonderfully inspiring story of Betsy Ross sewing the Star-Spangled Banner has always been in dispute. 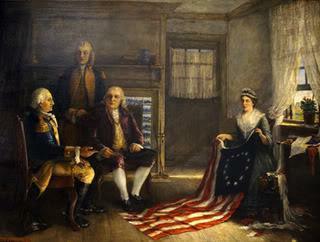 None of Canby’s sources had witnessed Washington’s visit or his grandmother making the flag, but all said they had heard Betsy tell the story many times. Though evidence shows that Betsy Ross made flags for the Pennsylvania Navy, nothing else in Canby’s story can be verified. On January 1, 1952, the United States Postal Service issued a stamp to honor the 200th anniversary of Betsy Ross’ birth. It shows her presenting the new flag to George Washington, Robert Morris, and George Ross. In their 2008 book, The Star-Spangled Banner: The Making of an American Icon, experts from the Smithsonian National Museum point out that Canby’s romantic tale appealed to Americans eager for stories about the Revolution and its heroes and heroines. Betsy Ross was promoted as a patriotic role model for young girls and a symbol of women’s contributions to American history.